Korean President Park Geun-hye and her Chinese counterpart Xi Jinping agreed Thursday they will strongly oppose North Korea’s development of nuclear weapons and work together to improve conditions in order to resume the long-stalled talks on ending Pyongyang’s related programs. In a joint statement at a summit held in Seoul, the leaders also said the two countries would strengthen cooperation on business and culture. “I had an in-depth discussion with President Xi to seek ways to resolve North Korea’s nuclear problem and to achieve peace and stability on the Korean Peninsula,” Park said in a joint news conference at Cheong Wa Dae. “We share similar views on bringing about the denuclearization of North Korea and are both opposed to its nuclear tests,” she said, adding that she believes that Xi’s visit to South Korea will send a “clear message” to North Korea. In response to Park’s statement, Xi said that China supports the peaceful unification of Korean Peninsula and that the denuclearization of the Korean Peninsula should be made through dialogue and negotiations. “Joint efforts are required to manage the security environment on the Korean Peninsula,” he said. The two leaders signed a set of 12 agreements on key issues aimed at turning their strategic partnership into a more comprehensive one. “We will establish a mature and strategic cooperative partnership to closely discuss mid- and long-term issues and share common interests based on mutual trust,” the two leaders said in a joint statement. The leaders agreed to conclude their free trade pact negotiations this year, launch a foreign exchange market to allow direct trading of the Korean won and Chinese yuan, and improve safety rules on food products such as kimchi. They also agreed to improve business cooperation on future industries and transnational environmental issues, and promote human resources exchanges to deepen mutual cultural understanding in the future. The agreements signed by the two leaders also urge the two countries to increase the level of consular protection for citizens and to step up efforts to tighten control of animal diseases such as avian influenza and foot-and-mouth disease. 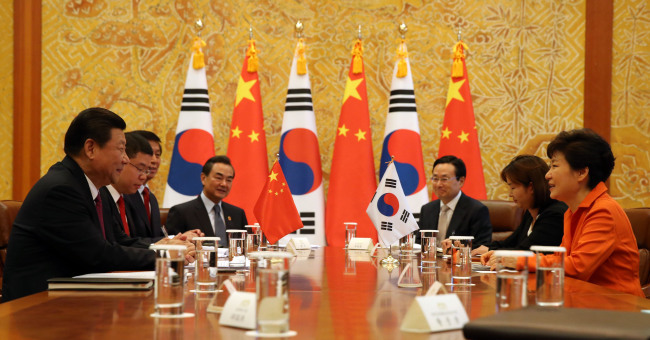 On the diplomatic front, South Korea and China agreed to reinvigorate negotiations at a higher level starting in 2015 to demarcate their exclusive economic zones, an issue that has long been a source of spats. They had held regular director-general-level consultations since 1996 as their EEZs overlap, but the talks made little progress due to stark differences between their claims. The two sides had the first such meeting in about three years last month. The two countries pledged “close cooperation” in the West Sea to curb illegal fishing by Chinese fishermen, boost joint maritime research and personnel and technological exchanges, and better protect marine life. They will also crank up collaboration in historical research including on the issue of Japan’s sexual enslavement of Asian women during World War II. “The two sides agreed to cooperate on joint study, sharing and donation of comfort women-related materials by their research institutes,” the appendix reads. The summit between South Korea and China came amid growing concerns about Tokyo’s move to push the limits of its war renouncing constitution. Japan said it would end a ban on collective self-defense by reinterpreting its constitution, which had prevented Tokyo from waging war and possessing war-related materials. Coinciding with Xi’s visit to South Korea, Japanese Prime Minister Shinzo Abe said on Thursday that Japan will remove some sanctions on North Korea. Xi arrived in Seoul on Thursday morning for a two-day state visit with a large group of political and business leaders, as well as Chinese first lady Peng Liyuan. 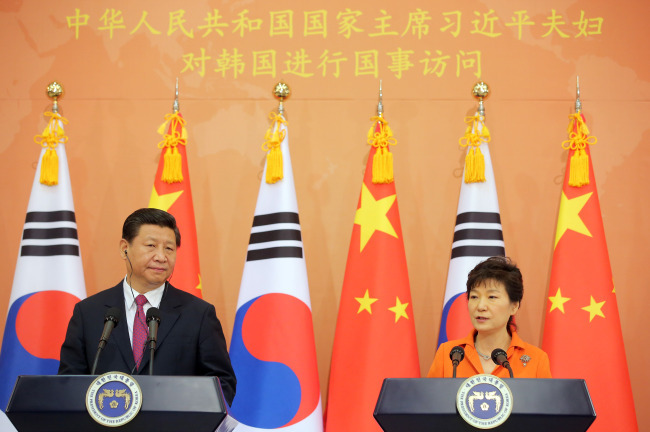 Xi’s trip to Seoul was widely seen as underscoring the personal ties he has built with his South Korean counterpart. Park visited China last June on a single-nation trip. The Seoul summit was their fifth meeting since the two took office last year. The Chinese leader’s visit to South Korea drew keen interest in and out of the country as he chose to visit Seoul before Pyongyang and Tokyo. He was also the first Chinese leader to visit South Korea before North Korea, a key ally of China. Expectations were high on what message they were to include in the joint statement regarding North Korea. Seoul has hoped for a strong and specific statement on Pyongyang’s nuclear weapons program. But it was widely expected that Beijing would maintain its stance of urging for the denuclearization of the Korean Peninsula, instead of mentioning its communist ally. On Friday, Xi is scheduled to meet National Assembly Speaker Chung Ui-hwa and attend a forum on business and trade with Park. Xi is set to give speech in front of hundreds of Korean and Chinese business representatives on the future of the two countries’ diplomatic and economic ties. 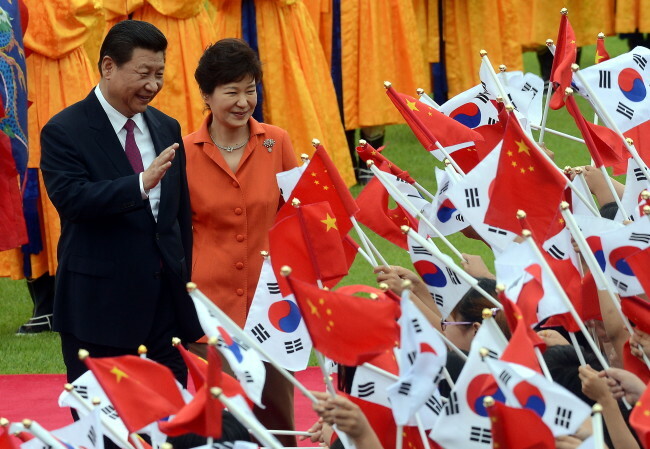 China, the world’s second-largest economy, is South Korea’s biggest trading partner. Trade volume between the two stood at $228.9 billion last year. Later in the afternoon, Xi and first lady Peng will be invited to a luncheon privately hosted by Park outside the presidential office. The Chinese president is also to give a speech to college students at Seoul National University and meet South Korean Prime Minister Chung Hong-won. On the sidelines of Xi’s official visit, first lady Peng on Thursday visited Changdeokgung Palace in Seoul as part of her cultural diplomacy. She was escorted by Cho Yoon-sun, senior presidential secretary for political affairs.